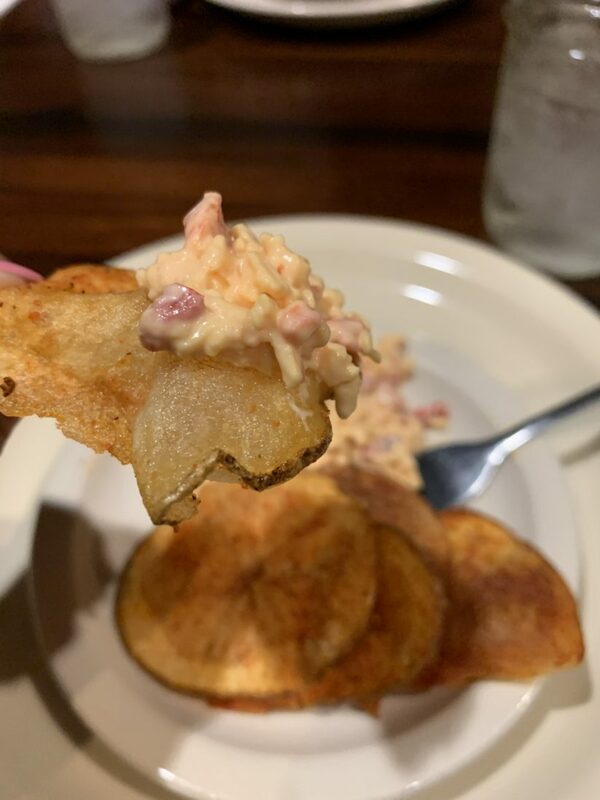 A most recent visit to Nashville, Tennesee aka Music City USA and my mouth is still watering from the amazing eats I enjoyed. 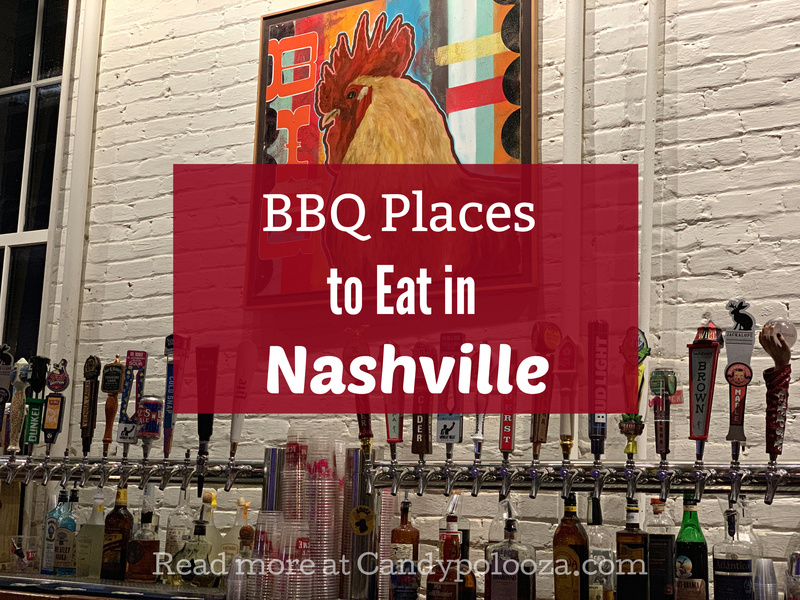 Sharing three great BBQ places to eat in Nashville with you. When we travel, we like to try the local cuisine as well as try new spots that we’ve seen on tv or read about on blogs or magazines. While there are many BBQ places in Nashville, these were highly recommended and I truly enjoyed them. Met up with Jen from 100 Directions for a day of sight-seeing and eating in Nashville before the start of the travel conference we attended. 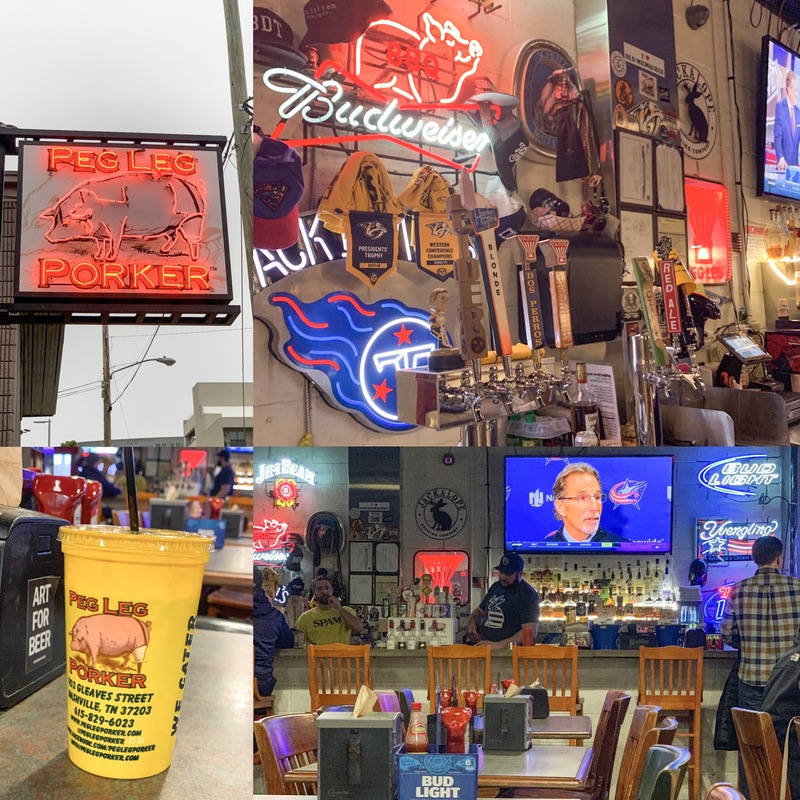 The first place we hit up in the Gulch area was Peg Leg Porker. Much like a bar they had a great list of beer and cocktails available. We were ready for a snack so we walked up to the counter to review the menu overhead. 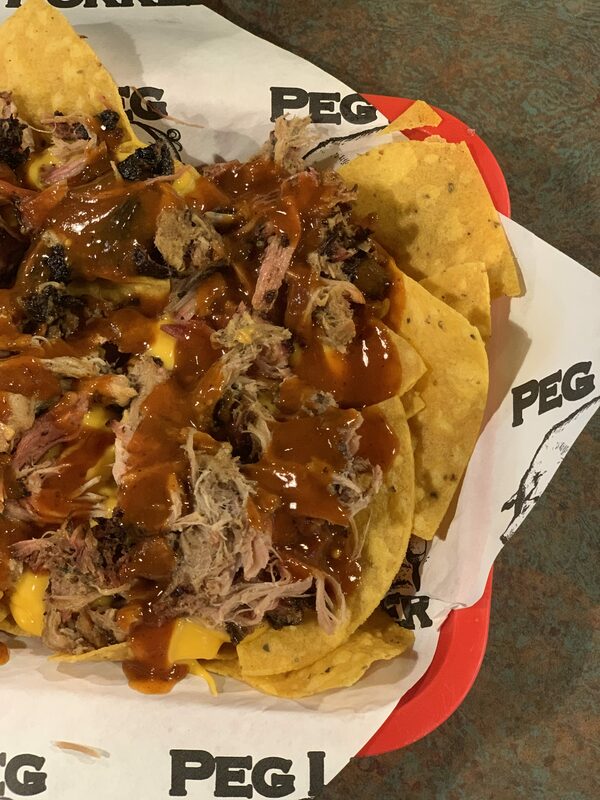 We wanted something we could share so we went with the BBQ Nachos for $9.95. We opted for no jalapeños, because we don’t like spicy (roast me, I don’t care! LOL). These nachos were DELICIOUS! The BBQ sauce was delicious as was the meat. My mouth is watering as I type this, that’s how delicious it was. They were super generous with the meat, cheese and sauce. Definitely enough to share as a group appetizer. Jen and I loved the nachos. Looking over the online menu now, I’m sad we didn’t try the Memphis sushi. Just wait til I go back! 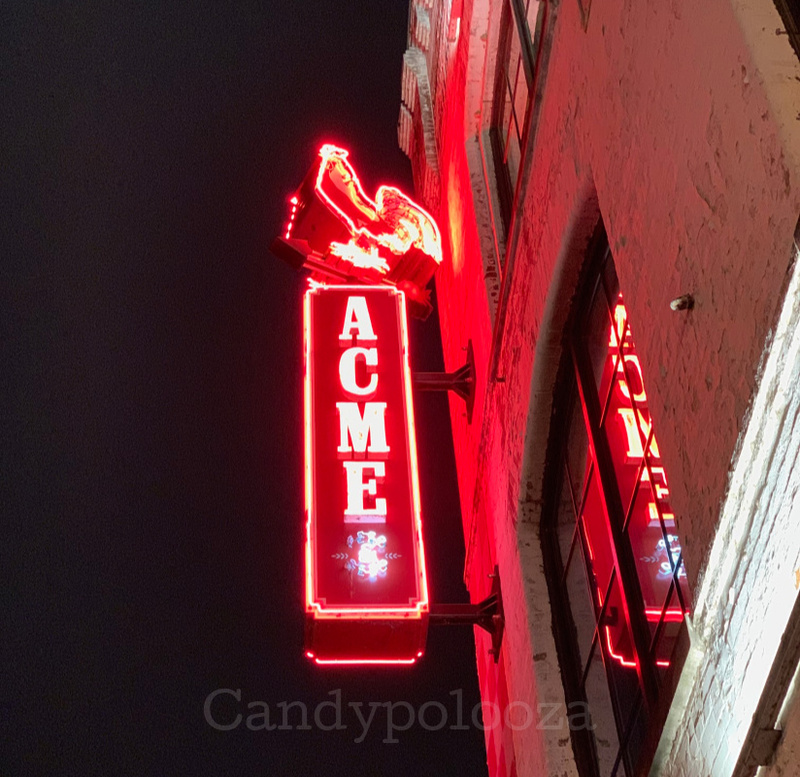 Moving right along to South Broadway street, while we waited for the evening trolley tour to begin we popped into ACME Feed and Seed for what we thought was only going to be dessert. We are so funny! Looking at the menu, everything looked AMAZING! And of course we wanted to try everything. But we didn’t. What we did have was pretty amazing though. Again we shared as we wanted to take in as much of the good eats as we could. The vibe was very cool and hip. Like a country store converted to a bar and restaurant, it was also hopping on a Wednesday night. At the southern part of Broadway, don’t let the country music star named bars distract you. 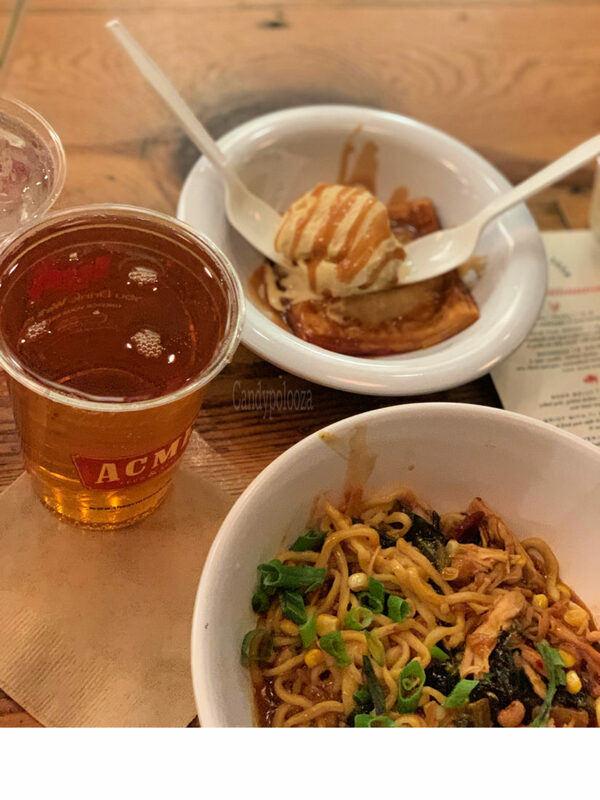 Go visit and enjoy a meal at ACME! I love a good low mein. When I saw Redneck Lo Mein I knew I had to try it. Jen and I “shared” it but I ate most of it. It was a delicious blend of the noodles, soy sauce, corn, smoked chicken, collard greens and black eyed peas. 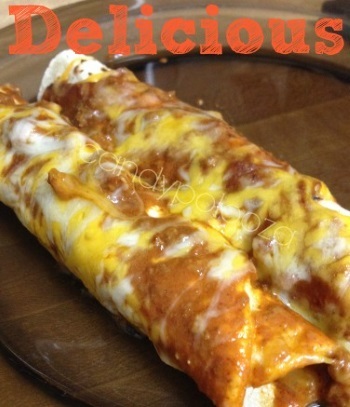 Yes, all that in a dish that still makes my mouth water. Truly unlike anything I’ve ever enjoyed. The house draft cider was fantastic as was the delicious handpie and ice cream for dessert. We were stuffed by the end of the night. During the FLOCK event we were treated to an amazing family style lunch at Martin’s Bar-B-Que Joint. Not only was the food incredible, the set up of the joint is pretty darn cool. Since we had a large group we sat away in a private area. I didn’t realize how large the space was, so if you need to have a big group, this is definitely a great place. 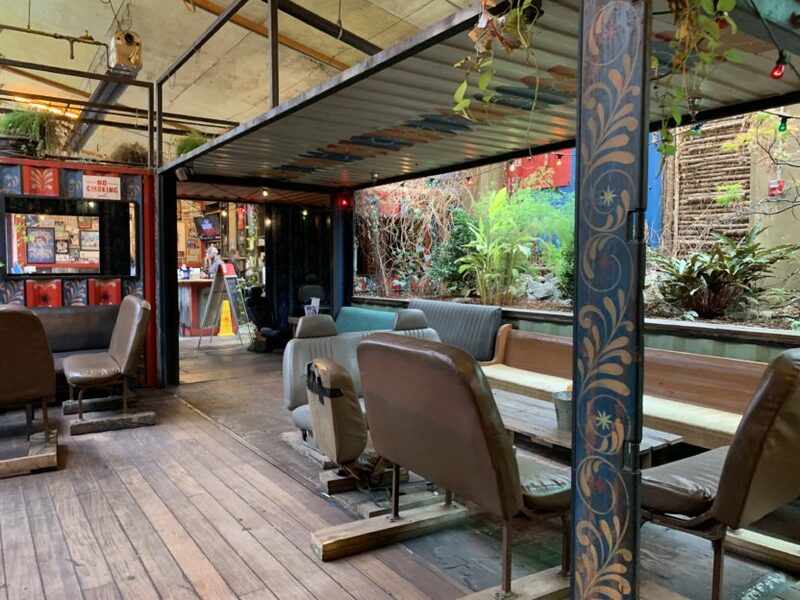 This is one of the outdoor seating sections. There’s even and outdoor area with stage! As you can expect most places have rooftop bar areas with stages for live music in Nashville. And now for the food.. We were served beef brisket, smoked chicken, cole slaw, mac and cheese, a delicious appetizer of pimento cheese and home fried potato chips. So delicious. and here’s an action shot of the dip ya’ll! Wowza! 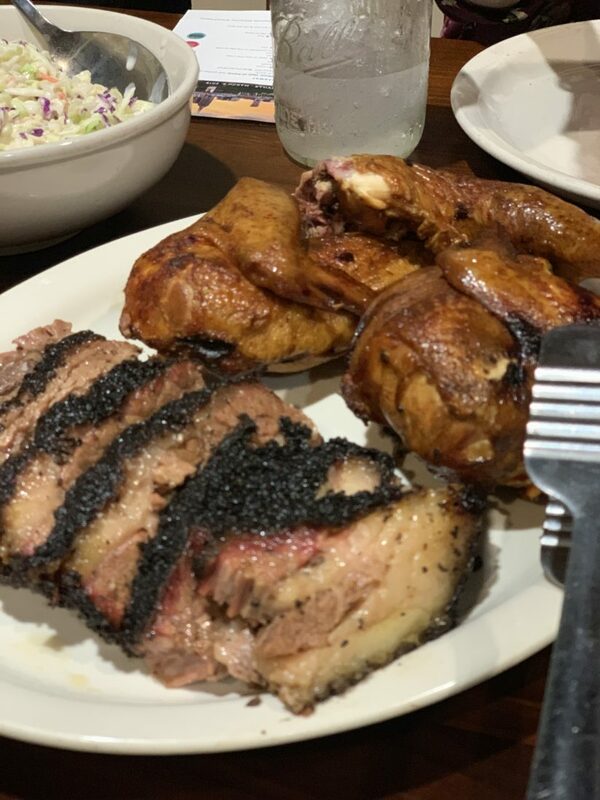 You are either now hungry or full from all of this amazing food. Are you thinking about going to Nashville? Besides the music, the food is worth the visit my friends. 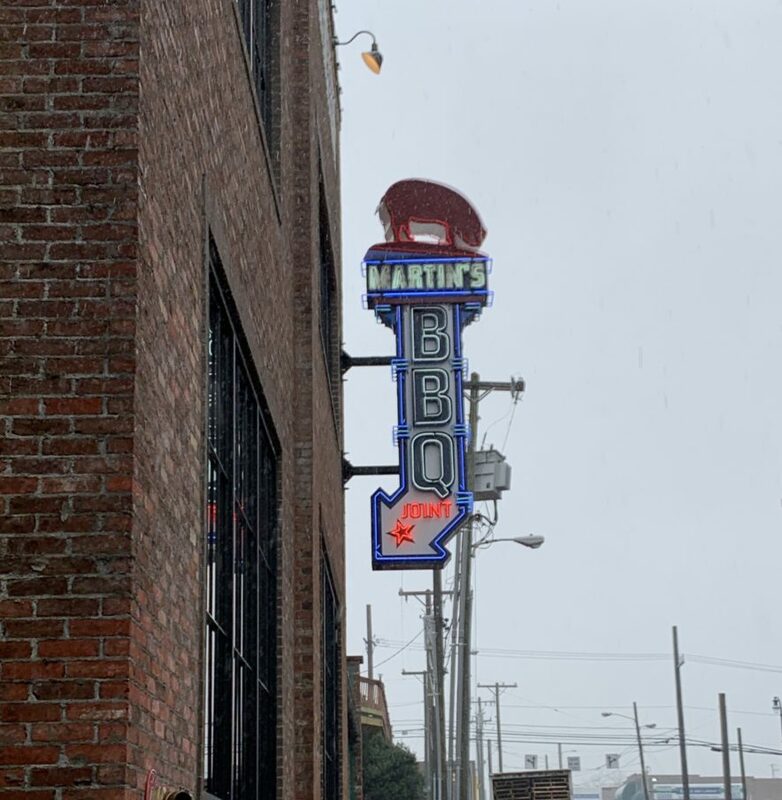 Thanks to VisitMusicCity and FLOCK for lunch at Martin’s Bar-B-Que Joint, it was fantastic! I’ll be tweeting some images from the pork smoker too. Be on the look out and holler at me if you need any trip planning tips for visiting Nashville. I loved it so much, I’ll be back very soon and I’ll be visiting in November again as well! Have you been to Nashville? Where do you recommend we go next time? 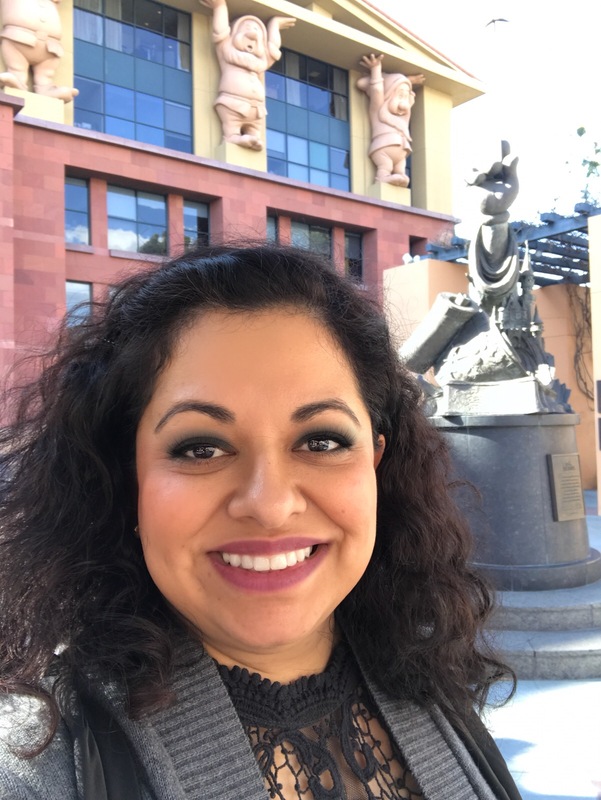 A Tejana on an adventure with her two sons and her hubs. 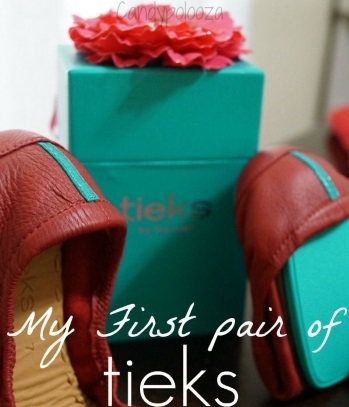 Learn about our familia, travels, entertainment, food and all of the fun we are having! Love to win? Make sure to enter the giveaways!